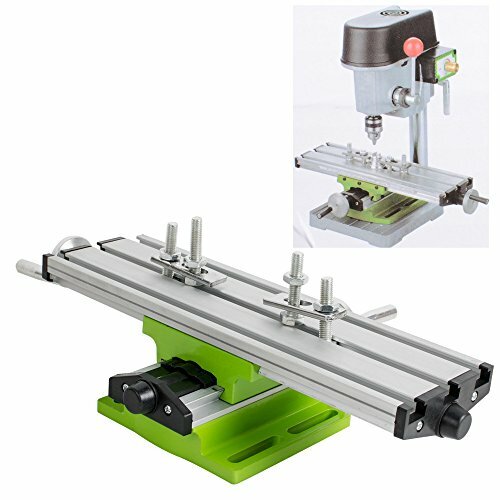 Multifunction Worktable Milling Machine Cross Sliding Table Vise For DIY Lathe Bench Drill (Shipping From US) by scenstar at UCBC Group. Hurry! Limited time offer. Offer valid only while supplies last. Description: Features： ✔️1.The table is suitable for Mini Drill and drill bracket series. It can also apply to other suitable machines. View More In Milling Machines. ✔️1.The table is suitable for Mini Drill and drill bracket series. It can also apply to other suitable machines. ✔️2.The work table is composed of several adjustable dovetail slot aluminum alloy compositions, can guarantee the minimum space and ensure the accuracy. ✔️3.The working table with three T shaped groove, standard size is 15x8x6mm. ✔️4.Scale is in front of the movable positioning. ✔️5.Zero adjustment handwheel rotates a circle of 1.25mm. A lattice is equal to 0.05mm. ✔️6.The X axis Y axis distance is 200mm, the stroke is 50mm. ✔️7.Working table size is 310x90mm and the height of 76mm, two working clamps are included. The work table is composed of several adjustable dovetail slot aluminum alloy compositions, can guarantee the minimum space and ensure the accuracy. Working table size is 310x90mm and the height of 76mm, two working clamps are included. If you have any questions about this product by scenstar, contact us by completing and submitting the form below. If you are looking for a specif part number, please include it with your message.